Wash your zucchinis well. 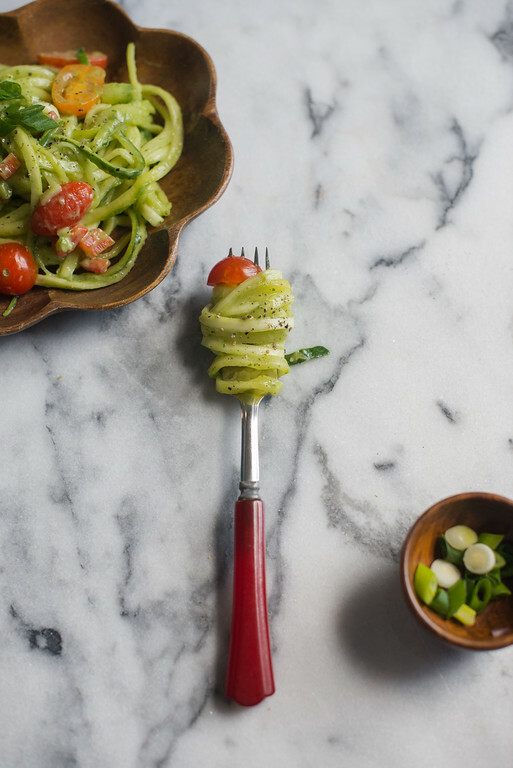 With a julienne cutter or spiralizer, slice the zucchinis length-wise to create your “zoodles.” You can also use a knife to cut noodle-width strips. Place in a bowl and set aside. Add prepared veggies to the bowl with your zoodles. In a blender, combine avocados, basil, parsley, garlic, lime juice, water, and salt. Blend on high until thoroughly smooth. Combine your noodles and veggies with your sauce and toss. Garnish with your choice of optional toppings.